Position: Associate Professor in Physics and Astronomy. 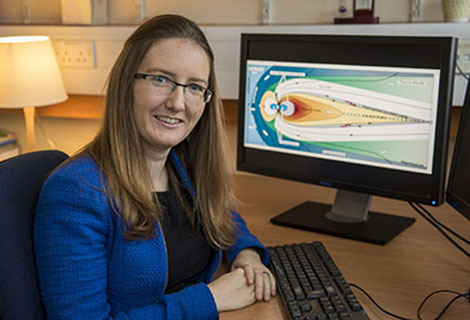 For Dr Caitriona Jackman, working as a professional planetary scientist is the realisation of a lifetime’s ambition. “There are so many great aspects of my job, from challenging myself with tough physics questions to travelling the world to present my results. “I have been involved with a range of teaching activities since joining Southampton. Each comes with its own challenges but I enjoy getting to know my students and doing my best to help them to have a good experience at University and to learn as much as they can. “My research involves the study of the magnetic environment around planets. Each of these planets has a magnetosphere, which is like a giant magnetic bubble formed by the interaction of the planet’s magnetic field with the solar wind. “Southampton is a place where success is rewarded, with our top students getting the opportunity to study particle physics at CERN or astrophysics at Harvard as part of our flagship degrees. “I knew of the strong reputation of the University from a research perspective and saw a great opportunity to join a growing Astronomy and Space Environment Physics group. “I think it is our duty, as well as a privilege, to explain what we do to the general public and to inspire the next generation. “I am particularly enthusiastic about encouraging more women into physics and our Southampton Women in Physics network is an opportunity to do this.